The Battery Hen Adoption Project was started in Brisbane, Queensland ten years ago, in 2009, (and we are still going strong in 2019!) to give ex-battery chickens a second chance at life. We look for long term loving homes throughout South East Queensland where the rescued hens can live a happy life after being in a battery cage. The hens quickly adjust to life outside the cage and are acting like "normal" chickens within a day. They rarely jump or fly, so are easier to contain than other hens, and tend to be much quieter vocally as well. Ex-battery hens make wonderful pets and bond very quickly with their adoptive family. They love to be with people and will follow you everywhere, including inside the house if you let them! 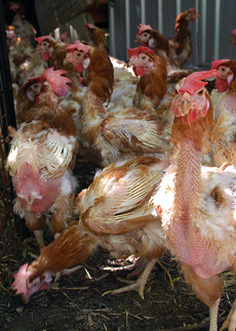 Over the past decade there have been so many lives changed for the better, not only hens lives but adopters lives too! We believe that adopting hens, or bringing any new animal into your family, is a major decision. We work one on one with each family to have the best possible outcome for both the hens and the adoptive family. A happy adopter! Click the photo to view our gallery.